HERE ARE THE RULES OF THIS ESTABLISHMENT. I deal with every kid with an even hand, and don't nobody give me no backtalk. All sites that don't follow the following rules will not be let in the ring, and new rules are capable of popping up at any moment in case a site is submitted that brings to my attention something I left out. If your page either doesn't get added or gets added and later removed, check this page to see what you did. Breaking these rules does not get your page permanently banned from the ring. If you fix it and ask me nicely, I'll let you in... Maybe. MAKE SURE TO READ THE RULES, because if you break these, submitting you site will just waste our time. Don't waste my time typing in "da bomb" for a URL or anything like that. Someone actually wasted five minutes of their life by doing that once. 2. Only Mr. T related sites. I haven't gotten any submissions from a site relating to them, but the band called The Mr. T Experience doesn't count. Also, if your page makes no references to Mr. T or not enough for it to count as a T page, it won't get in. A personal home page with the line "Mr. T rules" at the bottom doesn't count. 4. REMEMBER: You have to insert the ring html before you get into the ring. I've got about a zillion sites in the Webring queue that I'd really like to add, but they have no Webring stuff on the page. Without it, the whole ring breaks down. 5. ALSO: Before you submit your page, you have to MAKE IT FIRST. I ain't naming names, but two people have given me URLs with no T related material and only the promise of some someday. Go ahead and finish it first. Submitting it first won't speed things up any. 6. When you get the ring html, fill in the "(your id)" part with THE I.D. YOU GOT IN THE WEBRING SUBMISSION EMAIL! Thanks to Katie, the owner of Mr. T vs. Everything, for bringing this to my attention. This seems to have become a problem lately without me noticing. Some of you have taken to using "001" as an ID, even though IT's NOT YOURS, and others have used her ID for their own site, screwing up the whole ring, and making certain sites unaccessable. If you are one of these people please change it to YOUR ID. If you don't know it, Email me, and I'll send it to you. I'll let the existing sites slide, but ALL FUTURE SUBMISSIONS USING THE WRONG ID WILL NOT BE ADDED TO THE RING. You won't get any warning, you'll just be removed from the queue. Sorry. If ya can't play by da rules, ya can't play da game. 7. If your site has no original content, it will not be allowed in the ring! There seems to have been a rash of sites like these earlier this year, and it really ticked me off. I understand that grabbing sounds and images off the sites of others is often accepted and sometimes encouraged, (if you've seen more than 3 Transformers sites, you know what I mean) but stealing the actual content is just plain wrong. To these people (you know who you are) I have news for you: Right clicking and selecting "view source," then copying it and changing the color scheme does NOT make it your work, is simply lazy and uncreative, and could get you in BIG trouble when the people who made the original page find out. So far, I've seen "The Mr. T toughness Test," "Tickle me T," and a few other older T pages assimilated into substandard new sites, and one guy copied the source code from Mr. T vs. Everything and used it as his links page. I already have had to remove one page for this reason, and at least 2 more are currently in the Webring queue, but will not be let in. Using someone's pictures and sounds to make new, original, creative material is the foundation of Mr. T pages (look at any Mr. T vs. X page), but when ideas and hours of hard work are stolen, it is an affront to Mr. T and everything he stands for. Plagerism is not tolerated in the Mr. T Webring, sucka. 8. When you add the ring html, ADD IT TO THE PAGE THAT'S IN THE RING! A lot of people out there prefer to put the webring material on "ring pages" somewhere in their site rather than on the page that's in the ring. This defeats the whole purpose of a webring!! It's supposed to be a quick, easy way to navigate through similar pages. It should be "Look at the page, go back to the main page, click the webring stuff, move on," not "look at the page, be unable to find the webring stuff, look through some guy's personal page for the ring stuff, then give up and go back to Yahoo to find other stuff." Geez. 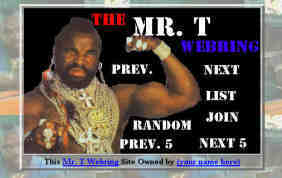 Needless to say, the use of a ring page for placement of your Mr. T Webring html will keep you out of the ring. 9. When you submit a site, submit your MR. T SITE, NOT YOUR PERSONAL PAGE WITH T STUFF SOMEWHERE ON IT. Another thing that destroys the concept of topical rings. This reminds me of how that sod David Nimmo changed his homepage's address to the address he had "Mr. T vs. Me II" (a page he calls "legendary," but the only thing legendary about it it how everyone on Earth hates it) on, so people trying to get there through Mr. T vs. Everything would instead go to his homepage. If you're trying to increase traffic to your page by using the T ring, sorry, it ain't gonna happen, fooh. 10. When you submit a site, BE PATIENT! Addition to a web ring isn't instantaneous. It could be days, it could be weeks. I can't check my email every day, and when I do, I might not have the time to check out the page and go through all the site addition stuff. If you got all the ring info right, and you followed all the other rules, you will be added. It just might not be right away. 11. Please don't screw with the ring logo too much. The default ring logo is a 22K file, and that's really not very big. I can understand maybe compressing it some if you have other large images on the same page and don't want it to take a day to load. But if it gets to the point where you can't make out the words "Mr. T Webring" or tell that it's a picture of Mr. T, you've gone a little far. I know I can't let you link to the image anymore because of the way Tripod works, but 22 kilobytes isn't going to put much of a dent in the 5 - 20 megs most homepage providers give out. Just leave it how it is, and if you still think it's too big, don't get carried away with the compression. Description: Enter a short description of your site. This is what's going to be shown on the "list sites" screen. Mr. T Webring "Classic" The original Mr. T Webring appearance. Not too complicated, and easy to fix if you mess something up. Mr. T Webring Appearance #3 The most complicated of the three, but possibly the coolest, using an image map, rather than text links. You lose the "Skip Next" and "Skip Previous" options, but let's be serious here... Who actually uses those? Another interesting note is that the picture of Mr. T is one I scanned that doesn't appear on any other site yet. After you've chosen a look for the ring material, add the code to your page, make the necessary changes, and email me at you_poseur@hotmail.com . If you did everything correctly, I'll put your site in the ring. I love it when a plan comes together.